Jammu & Kashmir is one of the most beautiful states famous for its sericulture and cold-water fisheries. Apart from this, it is well known for its saffron trade which in turn brings in a significant amount of foreign income. Though slow, manufacture and service sectors in Jammu & Kashmir are growing. Several consumer goods companies have also opened up units in the regions which calls out for more employment. This is one of the states with so much beauty and talents and developing resources. If you have moved to Jammu & Kashmir and become a part of this heritage beauty and wish to have a rental stay, then you’d have to set up a rental agreement, which becomes very much simple with LegalDesk.com. The Jammu and Kashmir Houses and Shops Rent Control Act, 1966, is the primary law governing the setting up of a rental agreement in Jammu & Kashmir. A rental agreement is a contract between the landlord and the tenant whereby the landlord permits the tenant to occupy the residential premises. What Are The Different Types Of Rental Agreement? 11-month agreement: This kind of rental agreement is set up for a short duration of 11 months. This agreement does not require registration, but the validity of the document expires in 11 months after which the document has to be renewed, if the landlord and the tenant wish to do so. Long term agreement: Long term agreement is usually set up for a longer time span, say five years, ten years or more. This is used mainly for residential purposes. Commercial agreement: This is an agreement set up by the landlord who lends the property to the tenant for business purposes. The document can be personalised as per the requirement of the firm. Accurate details: The details given in the document drafted should be best to the knowledge of both the landlord and the tenant. Lock-in period: This is the minimum time before which neither the landlord nor the tenant is allowed to withdraw the agreement. Security/Caution deposit: This is the amount paid by the tenant to the landlord at the beginning of the accord as security. This is to compensate any loss the landlord faces in the future due to the disregard of the resident. Rent Payment: The rent amount should be mentioned in the rental agreement. This guarantees that the tenant will not have to face an unethical rise in the rent price anytime in the future. Penalty charges: The landlord is allowed to impose a small penalty charge on the tenant if he/she fails to pay the rent amount within the stipulated time. Maintenance charges: All the maintenance costs are to be paid by the landlord unless specified otherwise. Pets: The landlord can specify if he entertains pets inside the residential premises. Parking and other facilities: The document should mention the services that are provided by the landlord. One can add any other clauses as per the requirement of the landlord and the tenant. If you are drafting a rental agreement, keep the following things in mind while doing so to make the process a little simpler. Follow these steps to create a rental agreement. Draft a document with accurate details of the tenant, landlord and the property to be rented. Personalise the rental agreement by adding necessary clauses as per the consent of both the landlord and the tenant. Print the rental agreement on a stamp paper of the recommended value. The document is to be signed by the landlord, the tenant and two witnesses. Get the document registered at your nearest Sub-registrar office. Stamp duty for rental agreement is the tax levied on the property that is to be rented to make it legally valid. The stamp duty rates vary from one state to another. The stamp duty for rent agreement is usually paid by printing the rental agreement on a stamp paper purchased after paying the recommended value. E-stamping is a technology introduced by the Indian Government to prevent the circulation of fake and duplicate stamp papers. Now, stamp papers starting from Rs 5 to any denomination are available at banks. Jammu & Kashmir introduced the system of e-stamping in the year 2015. But unfortunately, it’s not available in every district of the state as of now. Registering your rental agreement is always better because in that case, the document is legally validated and it would be helpful just in case a dispute arises in the future. Also, registering your document adds an extra verification to the details given in it. In India, notarization is not mandatory for rent agreements. Notarizing your document does not make it legally valid, but if you want to get it done, then you may proceed. However, notarization would ensure a better validation of the details given in the document. How To Create A Rental Agreement Online? Creating a rental agreement is no more a herculean task. be done in a more simple and in a much more faster way. You can create your own rental agreement online with the help of LegalDesk.com. To do so, follow the given steps. Visit our ready to customise; lawyer verified online rental agreement form. Fill in the details of the landlord, the tenant and the property to be rented. The document is to be signed by the landlord, the tenant, and two witnesses. 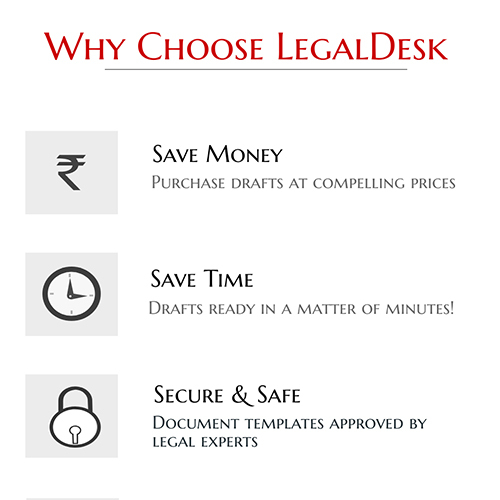 LegalDesk.com provides you a simple platform to draft and personalise your lease agreement. You can also find many other customisable legal documents such as Will, Affidavits, Name Change Package, Startup Package, Gift Deed, and many more. Rent Agreement Vs Lease Agreement – Which To Choose? There are 2 comments on "Rental Agreement In Jammu & Kashmir".